I've been watching the classic Doctor Who series, beginning with the start of the show in 1963. I'm up to Season 15, which aired from late 1977 to Spring 1978. That's half-way through the adventures of the Fourth Doctor (Tom Baker). Behind the scenes, the show was experiencing some major problems. A change in the leadership of the staff running the show, as well as late delivery of scripts, plus the BBC canceling a vampire-related script because it would have aired close to major Dracula production of the the network. 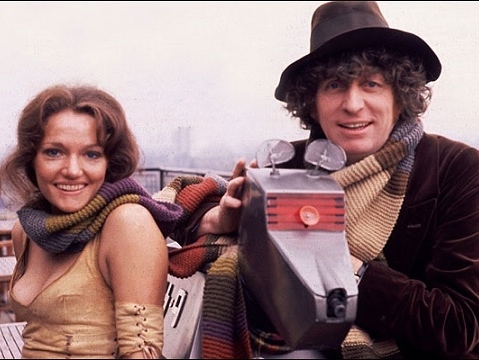 Add to this, Tom Baker hated the character of Leela, and the actress, Louise Jameson, took the brunt of his dislike. They finally had it out in the second serial taped (but the first serial aired), and the actors' relationship improved somewhat. Still, Jameson left the show at the end of the season. All the while, the British economy, under the leadership of the Labour Party, was in shambles. The show had its budget cut because of other expenses the network experienced due to the economy. In the winter following the airing of this season, the country was hit by several strikes, the "Winter of Discontent," leading to the Conservative Party's victory early the next year. And, in case you forgot, that's when Margaret Thatcher became Prime Minister. Remember the Brigadier speaking with "Madame" Prime Minister in Season 13? Now you know who he was talking to. The season began with a story at a creepy old lighthouse, and people dropping like flies. No, it wasn't Tom Stewart but an alien knocking folks off. We finally met the Rutans, who have been in a war against the Sontarans, in Horror of Fang Rock (4 episodes). At the end of the episode, Leela's eyes changed color from the effects of an explosion. That allowed Louise Jameson to not have to wear the brown contacts she had been wearing ever since her character was introduced. And, it's the episode where Jameson and Tom Baker finally had their confrontation. The second serial (though the first one produced in Season 15) also introduced K-9. I know a lot of people liked K-9, but I wasn't one of those. I remember the character from when I saw Doctor Who episodes 30-something years ago. I thought it was silly then. They did a good job of explaining why it looked like a dog: the scientist who built it always wanted a dog, so he made his robot look like one. Fans of Sherlock, or of Benedict Cumberbatch, might find it interesting that his mom appeared in the serial Image of the Fendahl (4 episodes) as a major character. Wanda Ventham had appeared in Season Four's The Faceless Ones. Yeah, she was hot. Oh, and she's still acting. She and her husband recently appeared in Sherlock as the title character's parents. By the way, the serial Image of the Fendahl was airing during the week of Hallowe'en 1977. As such, it had a theme appropriate to that time of year. The story involved a skull with a pentagram, a seer, a coven of aliens, and a big slimy worm that looked like it was dressed for Mardi Gras. I found The Sun Makers (4 episodes) very interesting. The script writer was having a row with Inland Revenue (the British agency that functions as the IRS does in the U.S.) and wrote the serial. In the story, those running the show and imposing the heavy taxes were overthrown. Of course, being British, they had a race of aliens running a "Company" that was responsible for high taxes. Unlike reality where it's a government that imposes taxes. So, even though it was the British government that was imposing the taxes that inspired the script writer, the left-leaning of those involved with the show turned the villain into a capitalist venture. The Doctor battled the Sontarans (and won) in the final serial of the season, The Invasion of Time (6 episodes). The Doctor lost two companions in the process. No, Leela and K-9 didn't die. They stayed behind when The Doctor left, after saving Gallifrey. He also took office as President of Gallifrey. It seems that nobody thought to hold the election that was to pit The Doctor against Chancellor Goth in Season 14's The Deadly Assassin. Since Goth died at the end of that serial, and The Doctor hopped in his TARDIS and went on other adventures, nobody assumed office. Well, The Doctor came back to Gallifrey to claim the office, since he was still officially a candidate, and, with Goth's demise, the only candidate, he took office. After defeating the Sontarans and saving the known universe, he left again. They kinda left it up in the air about his being president. I suppose we'll see what happens with that -- or not -- as well as meet the new K-9 that was still in the box at the end of the series, when the next season starts. That Leela was named after PFLP terrorist Leila Khaled tells you all you need to know about the political views held by the media in 1970's Britain.